Dactyl Publishing sell school supplies, including art pads, learning resources and personalised school leavers hoodies to customers around the UK. Before Dactyl Publishing got in touch with our team they only had their main website where they listed information about their products, along with detailed downloadable PDFs. Dactyl Publishing needed a new ecommerce store where they could sell their products quickly and easily to customers all over the country. Built in OpenCart version 2.2, the new Dactyl Publishing ecommerce store was given a fresh new look based around their existing branding. With bright colours, school imagery and a fun primary font, Dactyl Publishing's new look is perfectly suited to their education-based customers. The store utilised OpenCart's default features, giving the team at Dactyl Publishing the freedom to edit products, view orders and manage their store directly from the admin area. 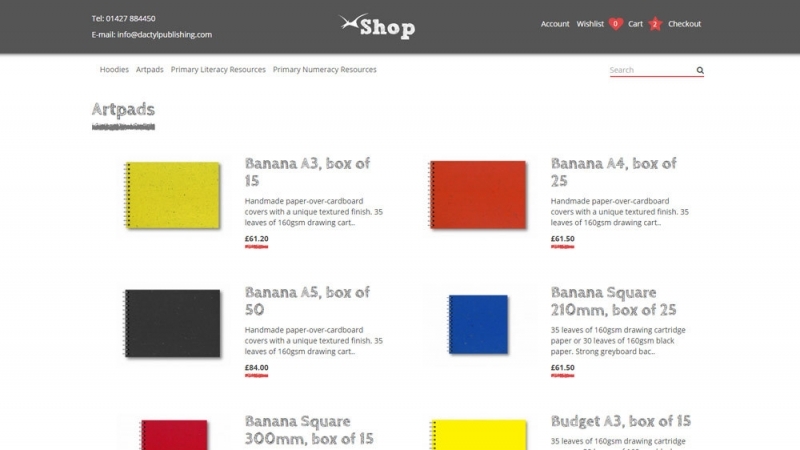 Dactyl Publishing's new ecommerce store was given a fun, personalised look. As well as their standard product range, Dactyl Publishing offers personalised leavers hoodies for schools around the UK. Our developers adapted the standard OpenCart multi-store functionality to allow Dactyl Publishing to create individual mini stores for each school. 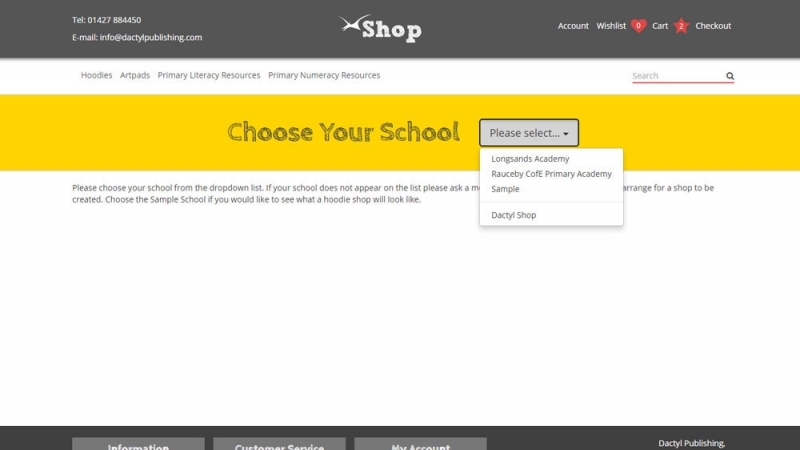 Once the school is selected, the user is taken to a personalised school store which features the products available for that school, the school's logo and the school's name - all of which can be added from a new page in the store's admin area. Dactyl Publishing can also choose to set an open and close date for each of the school stores via the admin area - the store administrator is automatically notified when a new store goes live and a countdown timer on the school store shows the customer how many days are left before the store closes. 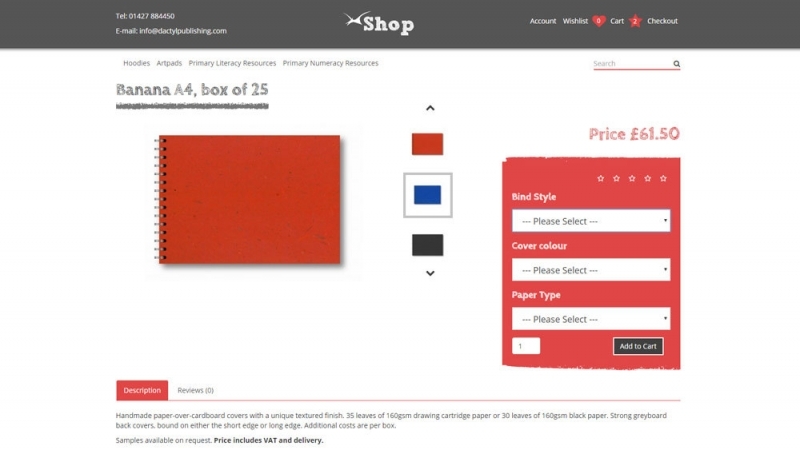 Users can buy products from internal mini stores created for their specific school. 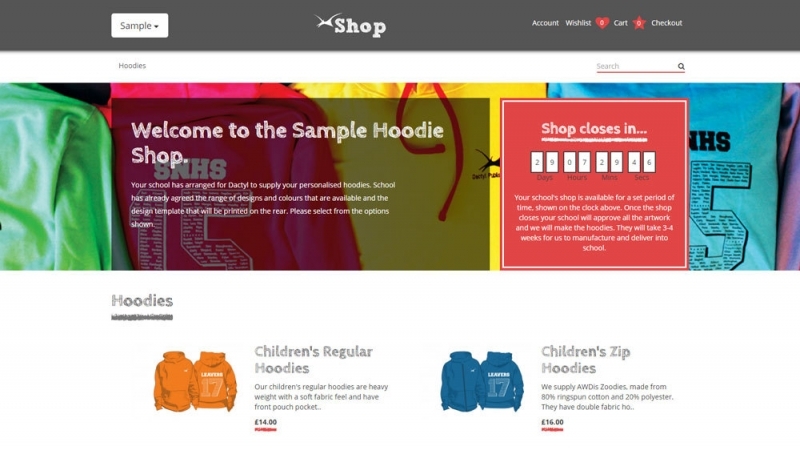 As the personalised school hoodies are all shipped directly to schools for students to collect, rather than to the student's home address, Dactyl Publishing needed a way to control the shipping options across the website. 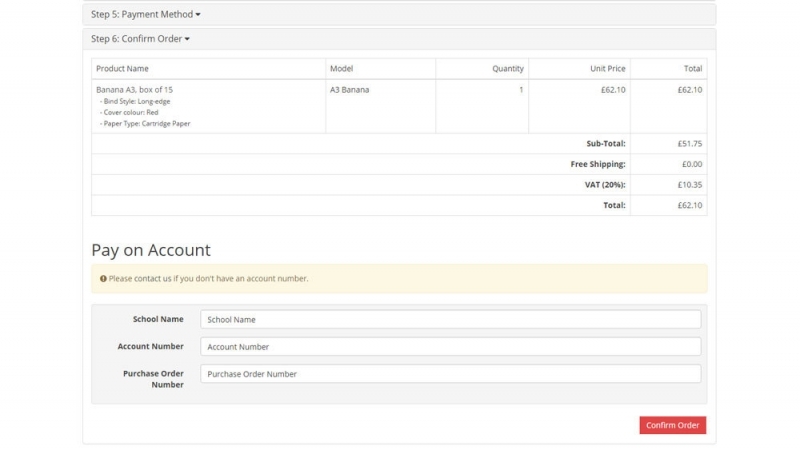 Our team modified OpenCart's standard features to ensure that if an order was placed via a school store, the school's address would be automatically populated and would be the customer's only option. However, if an order was placed on the main Dactyl Publishing store, the customer would be able to enter their own personal address. 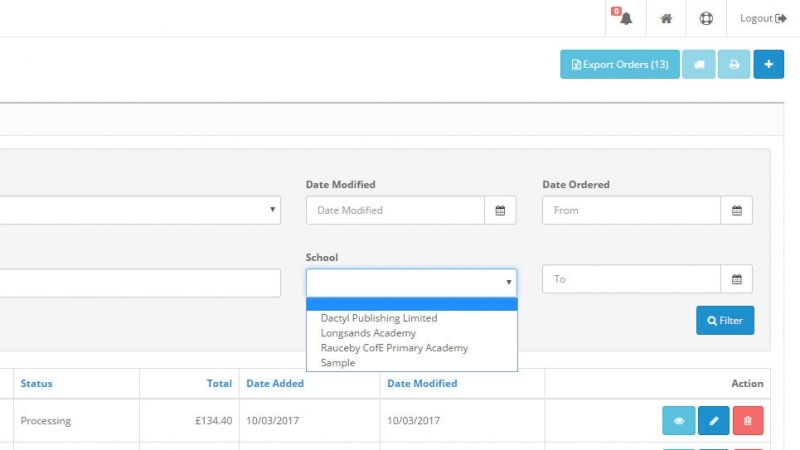 For schools purchasing classroom supplies, Dactyl Publishing offer a 'Pay on Account' system - rather than requiring all payments up front. Our team built a new payment method to allow customers to enter the details associated with their school's account and place their order; giving Dactyl Publishing a new way to take orders without requiring immediate payment. For each new school store which is created, Dactyl Publishing have the ability to choose which payment method is available. New payment methods & shipping restrictions make managing orders effortless. To boost the existing OpenCart functionality, our team added extra features to the store's product pages to give Dactyl Publishing's website a unique edge over competitors. Making ordering easy for students & parents was essential for Dactyl Publishing's new website. 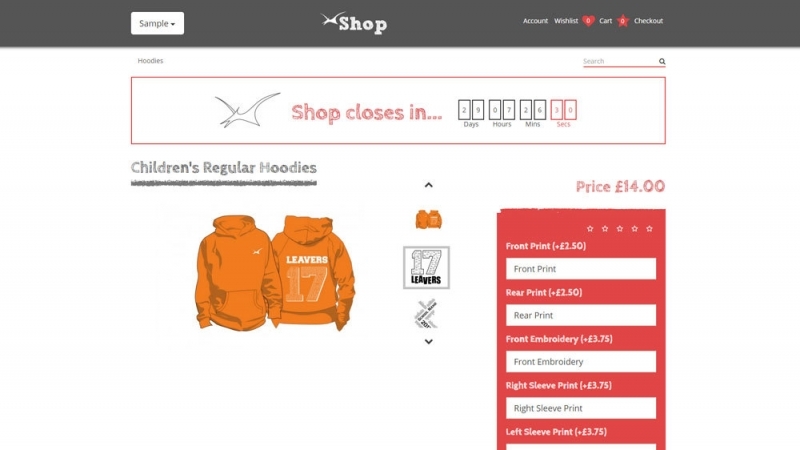 When a customer selects the colour of their hoodie from the available options on the product page, the product image automatically changes to show a hoodie matching the colour they've selected. In order to work with Dactyl Publishing's pricing structure, our team adapted OpenCart's existing option functionality to allow additional prices for text options - a feature which isn't available by default. 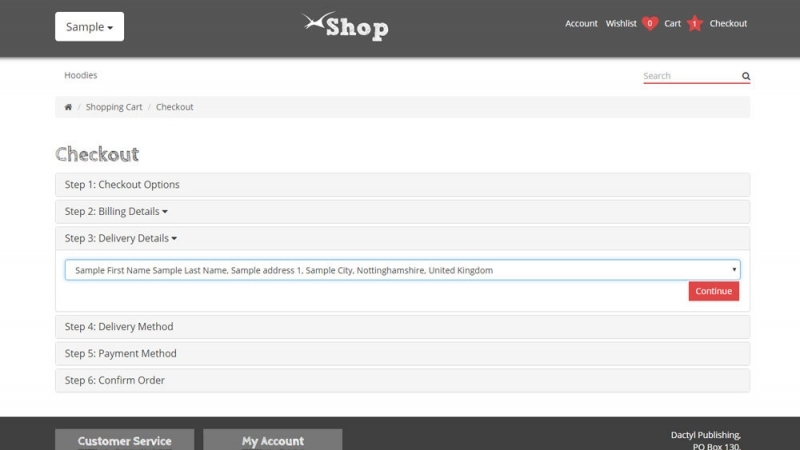 The admin user can now specify additional costs for optional product details like personalised embroidery. Bespoke product pages with functionality designed specifically for Dactyl Publishing's needs. To help Dactyl Publishing manager their orders quickly and efficiently, our team added a one-click export button to the store's orders section. With a single click Dactyl Publishing can now export a full list of every order placed on the website. As orders places on the individual school stores will be sent directly to the school's address, we included the ability to filter all orders by school as well as the standard OpenCart filters. With this, Dactyl Publishing has instant access to all of the orders going to a single school. Custom one-click order export & new filters to make managing orders easier than ever.